It is no accident the seemingly random series of strip malls known as Old Koreatown has a special coherence. In the early ’80s, a handful of Korean wholesale businesses capitalized on older, cheaper real estate around Royal Lane and Harry Hines Boulevard, forming what would eventually be named the Asian Trade District. Around them sprang the accoutrements of a tightknit community: Korean-based banks and insurance brokers, nail salons, grocers, and a newspaper. Among the warehouses and derelict auto shops, a restaurant scene with a deep history and unmatched vibrancy has flourished, from lovingly worn, homey spots with boxes of provisions piled in the corners to barbecue bastions where fire codes still allow diners to set meats sizzling over charcoal. The blank strip-mall exteriors belie the warmth to be found inside, where the food served is by nature communal. See what awaits you in Old Koreatown. You may wonder why you immediately feel so comfortable here. 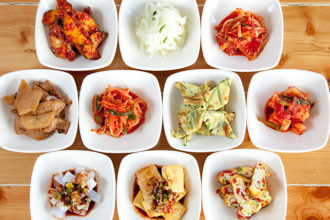 The collection of small side dishes offered at the start of a Korean meal. 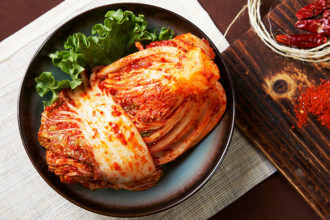 Often includes kimchee, steamed or pickled seasoned vegetables, cubed omelets, and mayonnaise-based salads. A bowl of meat, egg, and pickled and fresh vegetables spiced with gochujang, a fermented red chile paste (see below), and served over rice. 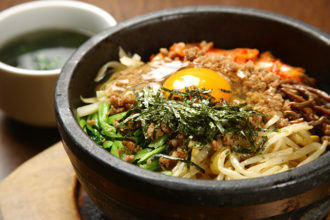 Dolsot bibimbap is served in a dolsot, or sizzling stone pot, that forms a bottom crust. Thinly sliced, marinated rib-eye or sirloin. 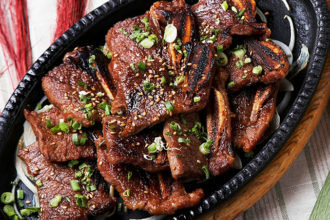 The Korean version of barbecue ribs. Beef short ribs are marinated in a mix of soy sauce, grated onion, garlic, Asian pear, sesame oil, and sugar before being grilled. Unlike European-style short ribs, which are cut along the bone, the ribs are usually thinly cut across the bone. This crosscut style is known as LA galbi, so named either for the lateral axis cut or as a reference to the California city where Korean immigrants popularized it. 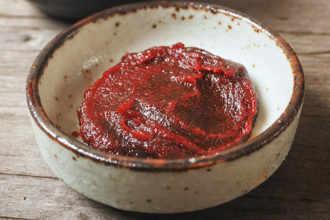 A sweet and spicy fermented chile paste that is the ubiquitous Korean condiment. It is made from chile peppers, glutinous rice, fermented soybeans, and salt. A spicy fermented side dish usually made with napa cabbage, bok choy, or radish. 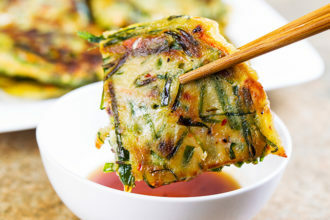 An eggy scallion pancake usually filled with seafood or kimchee and served with a rice vinegar dipping sauce. 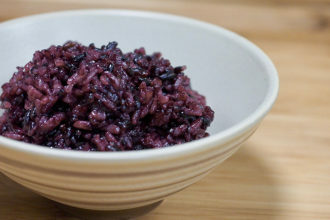 Cooking black rice with white rice gives this classic side dish its purplish color. It’s often served alongside miso soup and fluffy steamed eggs. Like vodka, but with a much lower alcohol content. The clear distilled spirit, traditionally made from rice, is the national liquor of Korea, where it comes plain or flavored. 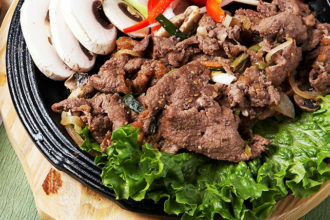 The elements of traditional Korean barbecue ignite the senses: the tantalizing sight of intricately marbled strips of beef, the intoxicating aroma of grilling meat, the popping and hissing of the grill. The usual suspects are brisket, rib-eye, octopus, chicken, pork belly, bulgogi (marinated beef), and, the sine qua non of Korean cuisine, galbi (short ribs). A quick primer: start with unmarinated meats, and then move on to marinated so as not to let char mar the grill. Grab tongs for gripping, scissors for snipping. Swaddle the finished morsels with lettuce leaves or dip them in sesame oil. Hail the parade of banchan, the complimentary side dishes that soon cover the table—kimchee (fermented cabbage), sukju namul (marinated mung bean sprouts), oi sobagi (cucumbers in chile sauce). There is no shame in reaching for what you desire. We’re all equal before the grill. Koryo Kalbi is the king of charcoal-fired barbecue. The marinated yangnyeom galbi is sweet-and-spicy charred bliss. This upstairs-downstairs spot, with its tufted banquettes, seems eternally ready to host a wedding reception. 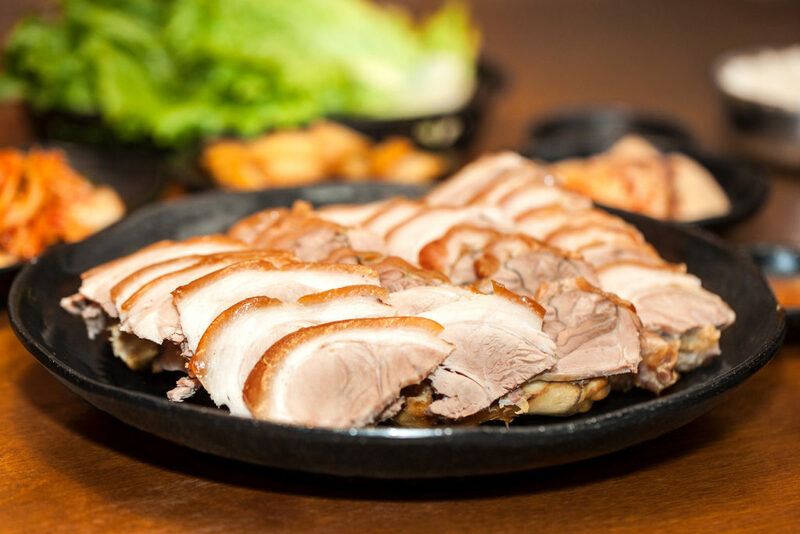 The quality of both meat and banchan is standard, but many come for the all-you-can-eat barbecue buffet, which is DIY all the way. You can choose your own meat from the glass-front cooler, but pace yourself. If you leave anything behind, they’ll charge you for it. The lunch buffet is a bargain at $16.95, but know that the coveted LA galbi, sliced laterally across the bones, is reserved for dinner. This hidden, homey barbecue haven is long on charm, with brick walls, bamboo plants, and servers (and an owner) who bustle like aunties in their aprons. You’ll find yourself returning here for other things as much as for the barbecue, which comes classic with steamed eggs, soybean-paste soup, and purple rice. There are great daily lunch specials mostly priced under $10, and traditional hot pots satisfy. Insider tip: if you call ahead to preorder your lunch, they’ll have it waiting for you. For beginners in the Korean barbecue game, newcomer Royal Palace is a neophyte’s dream. At the encyclopedic all-you-can-eat buffet, banchan choices are impressive. Slake your curiosity about burdock and spicy garlic stems, sweet boiled black peanuts and sliced fish cakes. Peruse the meat case and see what speaks to you most. You can try your hand at approachable LA galbi, but you can also sample messes of buttery beef tongue, tube-shaped intestine, and marinated squid. This reliable fixture offers authentic delicacies worth trying under the heading “cultural cuisine”—raw skate, raw crab, pig’s feet, Korean steak tartare. There is a satisfying haemul pajeon pancake, almost as many grill-at-table options as Koryo Kalbi (including tongue but not duck), and a whole host of meats done in the kitchen. With the quality of the banchan, the classicism of souffled eggs and purple rice, and the attentiveness of the service, do you really need to grill it yourself? The elegant doyenne of the Asian Trade District, with its burgundy awning and wood-paneled sushi bar, has stood on the corner of Royal and Harry Hines since 1979. The barbecue selection may not be as broad as Koryo Kalbi’s, but the galbi is prime Black Angus. A sequenced prix fixe dinner for two offers an intriguing foray beyond basic barbecue. Small servings of pine nut or vegetable porridge for dessert are a traditional touch no other place offers. There are plenty of other options to make a day—or a night!—out of Old Koreatown. Be sure to make time for these after visiting one of the restaurants. Spa Castle may be newer and flashier, but King Spa still has plenty to offer, from its indoor water park to the steaming salt room. After dipping in and out of frigid and steam-bathed pools, sweat it out in the sudatorium, rest in the pine salt room, and then you can nab a bowl of kimchi-accented soup. Plan to stay all day. A main lounge plus 14 private rooms provide ample options to cover your favorite songs while sipping on lychee soju from the full bar. Couches are comfy. Load up on bulgogi kimchi fries and belt your heart out. Before H Mart, this was the biggest Korean grocery game in town. It still stocks boutique brands you won’t find anywhere else. You can buy all the fall persimmons you can eat, find $6 bibimbap in the food court, and watch the tofu-makers make fresh, still-warm soymilk and tofu in the back corner by the produce. Grace Koo’s bakery replicates the modern, hip Seoul coffee shop scene with craft cold brew, exquisite cakes, and a host of scrumptious Korean bakery treats. Koo attended an esteemed pastry school. She puts that skill into light sponge cakes filled with fresh cream, decorated with bunny-shaped Swiss meringue puffs. Morning toast sandwiches are a staple Koo adapted from her days in Seoul. This teeny-tiny, shabby-quaint hideaway is where you stumble in on a late night for chicken feet before a karaoke crawl. The entrance from the pot-holed parking lot might be hard to spot, but inside, tucked into your booth cubby, you’ll find an impressive array of house banchan and soul-food dishes that could feed an army. Here, they excel in almond cookies, glutinous rice cakes topped with savory and sweet options like pumpkin and sweet beans, and milk buns filled with coffee buttercream. If you haven’t had Korean rice cake, which is similar in texture to Japanese mochi, this is the place to get them freshly made. This somewhat stark coffee shop serves frappes and affogatos, but specializes in the “flat green tea coffee,” a perfectly layered creation of green tea, coffee, and milk foam. The ambiance is quiet. All the better to contemplate your composition of white, black, and green that is guaranteed not to taste like any coffee you’ve had before. With a compact interior and dive-y charm, this mom-and-pop serves up an impressive list of traditional soups and stews. Dive into the delicately fragrant dumpling soup, with dumplings that pop with scallions, wisps of ginger, and juicy meat. Or the spicy seafood soup. Styrofoam take-home containers await you if your eyes were more ambitious than your stomach. At this beloved chain, the bakery case holds mousse cakes and macarons, and the beverage menu offers a full panoply of caffeinated and blended drinks with fruit, tea, and boba. (We recommend the green tea cream cake or the multi-layered rainbow cake.) They also serve several versions of the Korean shaved-ice dessert pat bingsu. A welcoming spot with well-priced, vegetable-focused dishes and a touch of fusion. A new chef has recently moved the menu in a more modern direction. The strip-mall-end spot is a good choice for lunch. 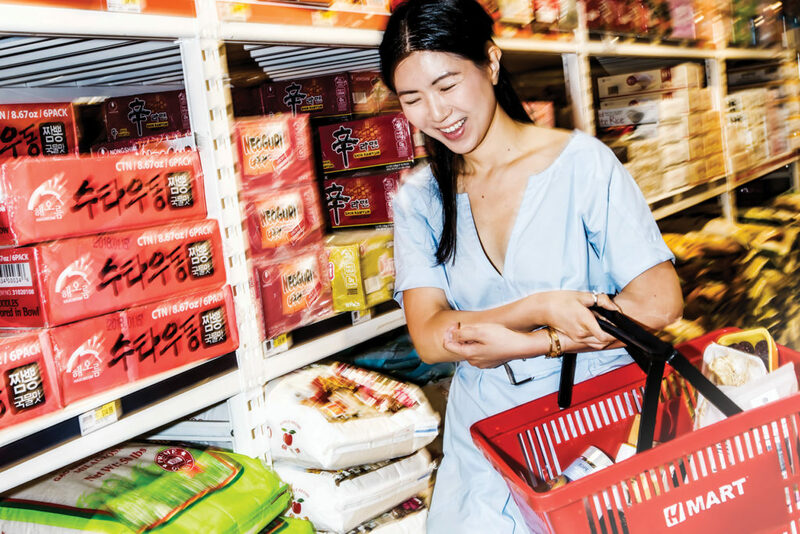 For 30 years, this out-of-the-way grocer has been a vital fixture, its shelves a labyrinth of Korean staples. Inside, you’ll find aisles full of sales and specials, and a meat counter in the back with marinated meats that will make you dream of bulgogi. Open until 4 a.m. on Fridays and Saturdays, this hole-in-the-wall lounge is where those in the know head after the Uptown bars close. The funky bar and rainbows of colored lights are perfect accompaniments to a night of unchained K-Pop. It all looks familiar at first. The red-and-white-checked basket liners, the recognizable shapes of drumsticks and wings. Oh, but it’s not. Those who have made Korean fried chicken their religion will tell you why. They’re converts to the thin, rice-flour batter’s unparalleled crunch. They worship the yangnyeom (gochujang-based, sweet and fiery), soy, and honey garlic sauces, and pledge fidelity to the classic rendition in which chicken disappears under a mound of scallions. They praise sides of diced pickled daikon radish and shredded cabbage slathered in Thousand Island dressing. Be forewarned: all it takes is one bite to be inducted into the cult. Show Some Leg: Mounds of scallions, pickled daikon, and a multitude of sauces join the fried chicken party at No. 1 Plus Chicken. No. 1 Plus Chicken is cramped but delightful, with tightly packed stalls, tableside call buttons, and courtesy plastic gloves that maintain decorum during even the most ravenous feasts of saucy wings. They make the best version of scallion chicken. Juicy breast-meat nuggets hold up a mountain of shredded scallions and rivers of honey mustard sauce. 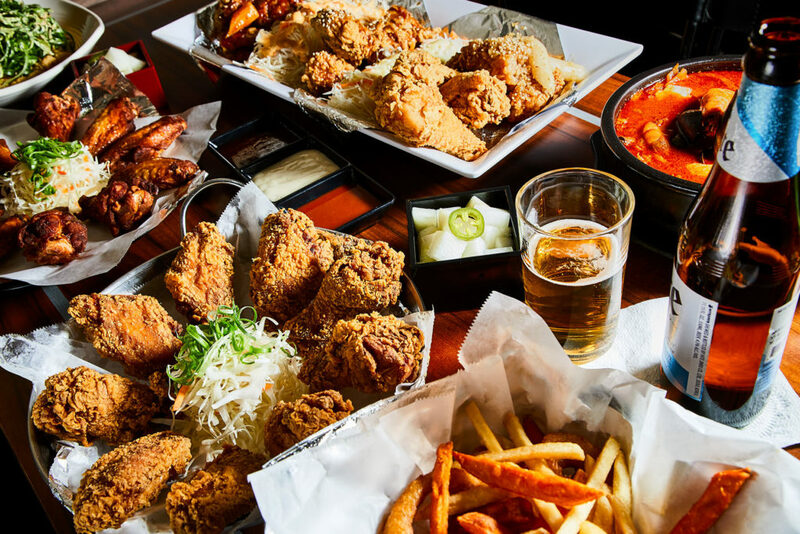 At the first U.S. locations of this trendy Korean chain, you can stick to one part (wings, breast nuggets, drumsticks) or order a mix by the half or whole bird. For a healthier option, the oven-roasted chicken comes two ways, with or without the rice-batter coating. Sauces include the slightly miscategorized powdered “cheese seasoning,” spicy mango, lemon pepper, and sweet chili; order the drumstick sampler and try them all. It’s the quintessential Korean fried chicken, a paragon of ethereal crackle and sealed-in moisture. The most adventurous snacks—silkworm soup and squid jerky, which is popped in the mouth with cashews—should be saved for the intrepid or already initiated. This Korean franchise serves decent wings, but their specialty is whole, flavorful, wood-fired roast chickens served on skillets over beds of crusty rice—“nurungji” being the term for the rice that scorches and crisps at the bottom of a cooking pot. The space between chicken and rice is a moat to fill with corn and cheese, if you wish. Pot Luck: The garlicky pork mandu (dumpling) soup at La Hanbat Sul Lung Tang soothes the soul. This counter-order spot is the only place you’ll find sundae guk, a soup with house-made blood sausage (stuffed with pork blood and glass noodles) flanked by slivers of tripe and tongue, its surface thick with sliced scallions and jalapeños sprinkled with nutty perilla seeds that lend depth of flavor. If you’re in the mood for spice, the pork neck soup is hearty with potato, bean sprouts, and neck bones bearing flavorful meat. Regulars know to snag a sleeve of kimbap, Korean vegetable sushi, on the way out. At this no-frills spot, blond-wood tables are set with kimchee, rice, a giant tub of scallions, and salt and pepper shakers to adjust the unseasoned broth for which the place is named. Sul lung tang—a milky beef bone broth rich with collagen—comes with bits of brisket, tongue, intestine, or flank (you choose) and carte blanche for scallion flurries. Also good: garlicky pork mandu (dumpling) soup, the dough-wrapped fillings cradled in a broth with egg, nori strips, and rice cake slivers, like egg drop meets wonton soup. Insider tip: you can get frozen dumplings to go. E Rae was once a humble but loved sit-down place. Now it offers a case of items to go, with handwritten signs in Korean and boxes piled in the corners. Patrons come in the afternoon to take home mashed tofu with the flavors and fire of kimchee, seaweed salad, and soups. Heat up the seaweed soup with a broth of simple Korean miso and slurp the slippery kombu. Notice the nutrients. You haven’t really lived the Old Koreatown scene till you’ve followed Old K-town days with Old K-town nights. The moon is rising. The lights begin to glow. The potholed parking lot feels right. Leave a Mark: At Dan Sung Sa, you can write on the walls, partake of corn cheese (the Korean version of corn casserole), and sip a shot of yogurt soju. 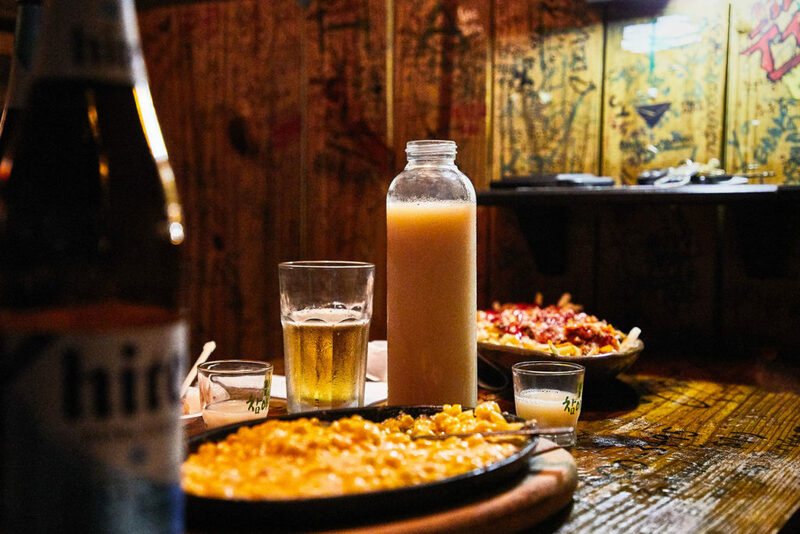 At this beloved karaoke dive bar, the walls of wooden stalls are tagged by regulars, who hunker over yogurt soju or makkoli, the creamy, tart-sweet, banana-flavored rice wine. Food runs the gamut from the $2 rice box with an egg to sliced omelet over cabbage strafed with ketchup and Thousand Island dressing, like glorified college dorm food. Many will say you shouldn’t even consider stepping in before 10 pm. I say there’s no hour. Order a cocktail. Tag your presence. And be enveloped by the K-pop pulse. Open until 2 am Monday to Thursday; until 2:30 am Friday to Sunday. True to form, the soju list takes you through Japanese shochu and its older and less boozy counterpart, Korean soju, with its rainbow of fruity flavors. Fusion snacks include wasabi squid, grilled mushrooms with sesame oil, and the incomparable “yolo” chicken, served in a skillet with a lake of cheese and tortillas. In this glorious fusion of Korean grub and offbeat modern sleekness, the question is, do you want a $30 shot of single-malt scotch with your honey-butter fries—or a glass of Franzia? Open until 2 am Sunday to Thursday; until 2:30 am Friday and Saturday. At Dal Dong Nae, they understand that sometimes you want Korean soul food: pajeon pancakes filled with kimchee, bubbling cauldrons of soup, volcanic mounds of Korean rice cakes oozing chile sauce, and the most enticing array of banchan. It’s nice to know that here, almost until dawn, something good awaits your soju-fueled late-night cravings. Open until 2 am Tuesday to Saturday; until midnight on Sunday; closed Monday. An elderly couple are your gatekeepers to late-night Korean barbecue in this futuristic space. He lowers coals into the grate; she tends the food. Walking down the restaurant’s dark hallway, the black walls and metal partitions make you feel like you’ll barbecue on the moon. But order a combination meal for the table, with an excellent mix of grilled meats, banchan, and a carafe of soju, and you’ll be brought back down to earthly delights, the restaurant transformed into a Korean village at night, where each cubicle is a warm, smoky hut. Open until 2 am Monday to Saturday; until midnight on Sunday. Snowy Village in New Koreatown is a splashy ice palace for pat bingsu, the shaved ice frozen milk dessert popular everywhere in Korea. It arrives as an enticing Matterhorn, soft as fresh powdered snow and mounded with matcha powder, red bean paste, rivulets of sweetened condensed milk, or sliced mangoes and strawberries, all topped with clouds of whipped cream. 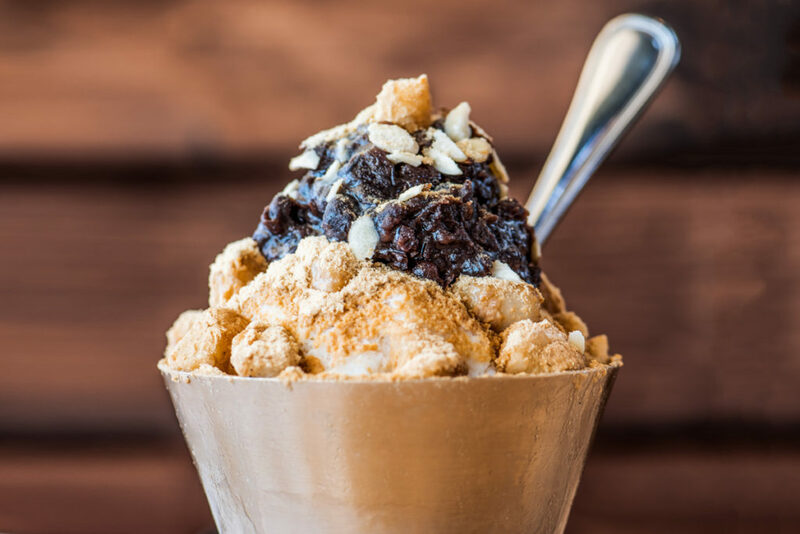 In Old Koreatown, head to 9 Rabbits or Mozart Bakery for a smaller array of shaved ice toppings. Cast-iron machines at Cocohodo Walnut Pastry, a popular U.S.-based chain with a location in New Koreatown, make fresh batches of hodugwaja. 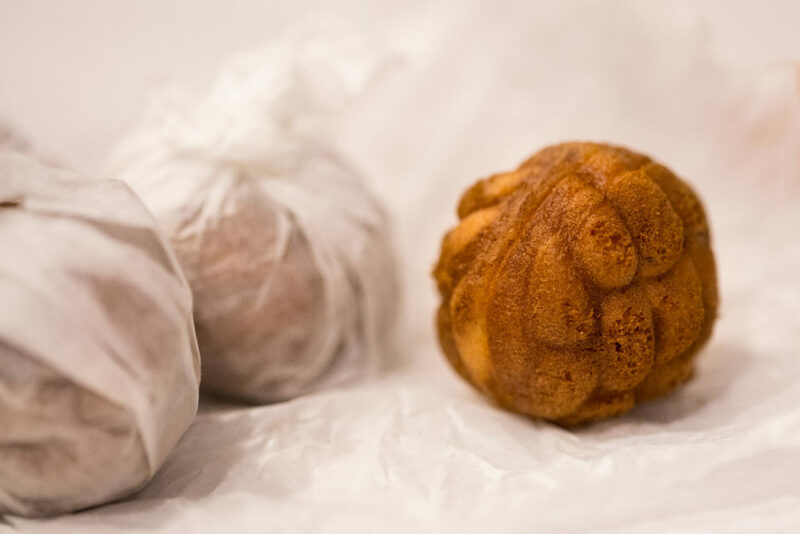 The classic molded pastry shaped like a walnut holds red bean paste and a walnut morsel at the center. Eat them hot or take them home by the dozen. New Koreatown is the epicenter for the Japanese fish-shaped waffle cake that’s a popular street-food treat in Korea. At Snowy Village, they make an appearance as flaky croissant dough waffles that encase fillings that range from red bean to Nutella and banana. 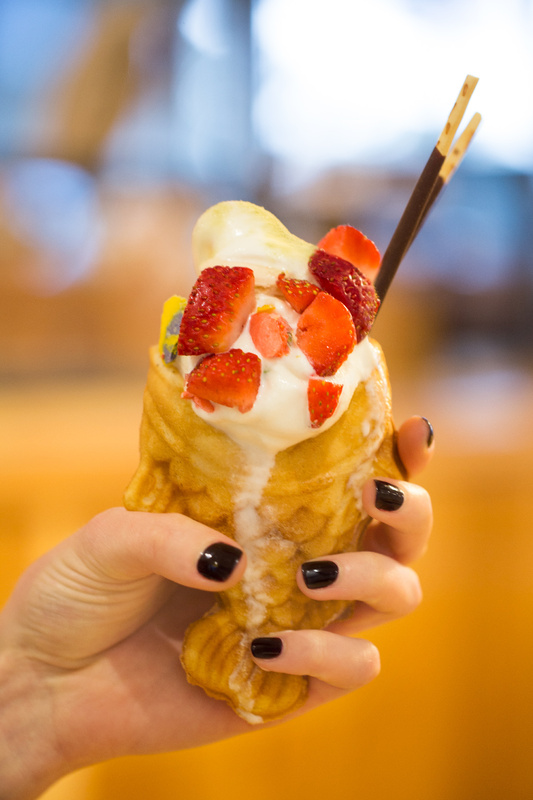 At Cocohodo Walnut Pastry, classic taiyaki are spruced up as fish shaped waffle cones whose mouths hold swirls of soft serve in flavors like matcha and taro. Ask for Nutella in the tail, if you wish. And at 9 Rabbits, Grace Koo serves them filled with red bean paste, custard, or Nutella filling, topped with soft serve ice cream, and decked with Pocky sticks, crushed macarons, and strawberries. A number of places highlight the Korean affinity for the fluffy airy textures of and elaborations of French pastry. Airy buns with a texture like brioche join cakes that fall into the categories of mousse and fresh cream cake—all loft and texture. At Tous Les Jours Bakery, inside H Mart in New Koreatown, honey castella cakes (an eggy sponge) are like soft slippers. A slice bears the name cloud cake, and a multi-layered crepe cake looks like a millefeuille. Grace Koo at 9 Rabbits in Old Koreatown excels in sponge rolls, massively light, filled with cream, and precisely and whimsically decorated with meringue bunnies. Her French patisserie training allows her to bring unusual finesse to flavors like mocha praline, green tea, or Japanese sweet potato, topped with a crackling sweet potato chip. 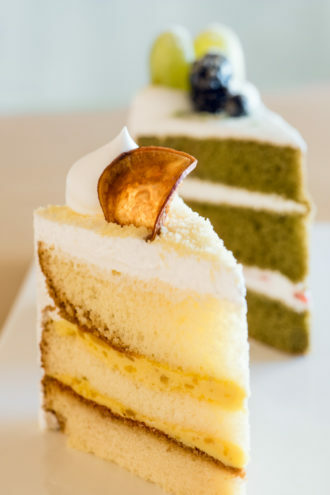 Nearby, Mozart Bakery also makes a variety of cakes, like their popular green tea chiffon cake and the rainbow slice that looks exactly as it sounds. The story of Korea House is the story of an institution, even if this is somehow the first you’re hearing of it. It is the story of how its owner, Sung Kim, came to open one of the first—and still the longest running—Korean restaurants in Dallas, and how Old Koreatown grew up around it. 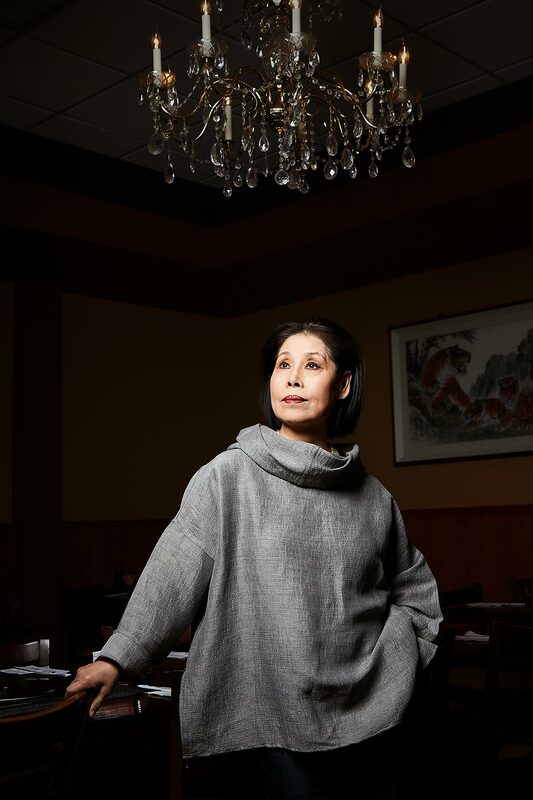 When Kim opened her first restaurant in Richardson, in 1979, she wanted to stay true to her mother cuisine and culture. Most of her ingredients had to be shipped from New York. The formal hanbok worn by her staff made a splash; clientele would ask servers to turn and model the bright, ornate designs. By 1986, Kim opened a second restaurant, Korea House, on the corner of Royal Lane and Harry Hines Boulevard, at the heart of what was becoming a concentrated Korean business district. Kim’s daughter, Caroline, remembers the clientele that frequented the restaurant when she was young, the businessmen who ordered kimchee-jjigae and talked endlessly over beers late into the night. They were the old guard, and Korea House was the place they could hang their hats and feel at home. Sung Kim’s sense of classicism is expressed in the Korean vases and ornamental screens, purchased on trips to Korea, that adorn the tasteful VIP rooms; in the banchan, arranged just so in their dishes; and in the barley tea served in cut-glass goblets. Over the years, as the unofficial ambassador of Old Koreatown, Kim has welcomed two Korean presidents, as well as other dignitaries. “What do you serve a president?” I ask. “The same,” she answers. 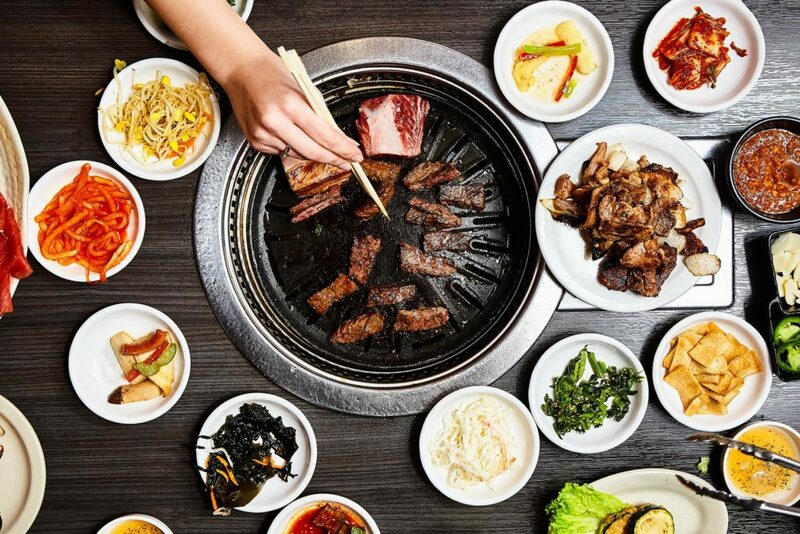 Caroline Kim says visiting Koreans have remarked on the attention to detail, the cuisine reminding them of traditional tastes even more so than in the Korean restaurants of, say, Los Angeles, where the community has changed more. When Korea House opened, crosscut LA galbi was still so new it wasn’t even offered on the menu. The Richardson restaurant has long since closed, but Sung Kim wants to stay the course in Old Koreatown, to continue being a solid presence in the community. She and her daughter dream of seeing a Korean community center in this neighborhood, once seedy, that she has seen blossom. 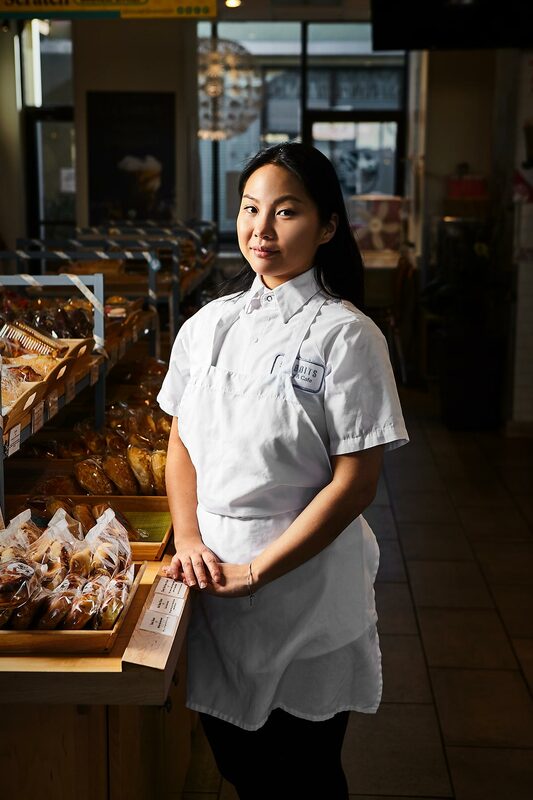 What we have in Grace Koo’s 9 Rabbits Bakery is a version of Seoul coffee shop culture, as interpreted by one young Korean-American trained exquisitely in pastry. Koo attended the esteemed Lenôtre pastry school in Paris, where she put in her time perfecting macarons. Then she spent five years in Seoul, running a restaurant pastry program and becoming enamored of the city’s vibrant coffee shop scene. There, along tiny neighborhood streets, airy shops with traditional wooden-slat fronts showcase custom espresso and Kyoto cold-brew machines. “Design-wise, they’re a Pinterest dream,” Koo says. She purchased a cold-brew machine, before it was patented, from acquaintances in Korea who developed it. She brews beans from Eiland, a craft coffee roaster in Richardson. Koo’s coffee shop may be the cutest place in town to find a wonderland of Asian treats: red bean buns, butter cookies, and light spongecakes filled with fresh cream, with flavors like Japanese sweet-potato mousse, and decorated with puffs of cream shaped like bunnies. “I wanted things that people knew from childhood,” she says. Recently, she added options for quick lunches, as well as something people might miss from back home: Korean morning toast. She makes the popular breakfast sandwich with coleslaw and jam, or lunch sandwiches with crab or egg salad, both served on the house milk bread. And so she added it to her small, pretty world, accented with rabbits. It’s true: there are some things you won’t find in Old Koreatown. Its younger, fashionable sibling, New Koreatown, is (as the name implies) a more recent outpost of shops in Carrollton clustered around the mega Korean market H Mart and Asian grocer 99 Ranch Market. A popular stop for boba tea and trendy desserts, it also offers a few distinct specialties—a hybrid of traditional and sleek. 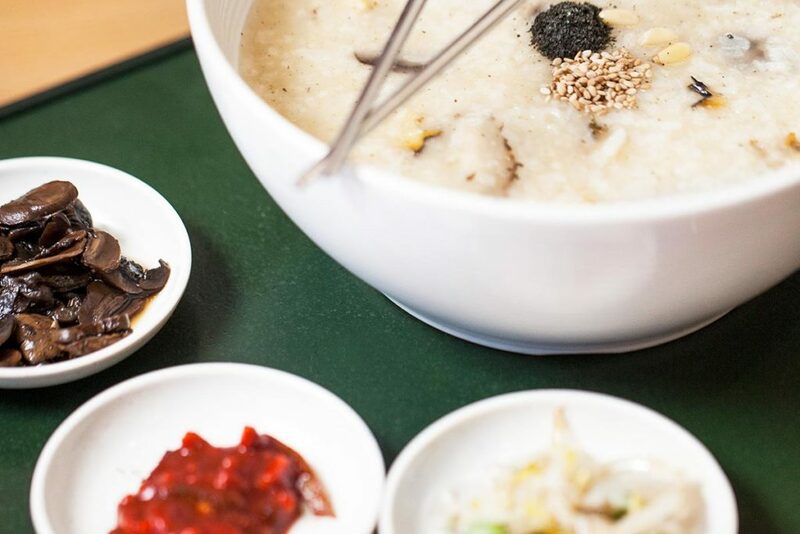 Owner Kristin Lee’s cozy spot in H Mart has a rice grain mascot and a menu devoted entirely to the comforting rice porridges called juks, with nutritionally minded ingredients like fresh abalone and ginseng. For dessert are slightly sweet bowls of pine nut or pumpkin juk, thick, creamy, and soothing. A visit offers more than sustenance; it nourishes the soul. People come to this otherwise unremarkable Korean restaurant for the rounds of homemade blood sausage; the impressively fanned slices of spice-infused boiled pork belly (bossam); and jokbal, a mound of delicately pink slices of braised and deboned pig’s trotters, served family-style with fermented shrimp sauce and all the fixings to make lettuce wraps. 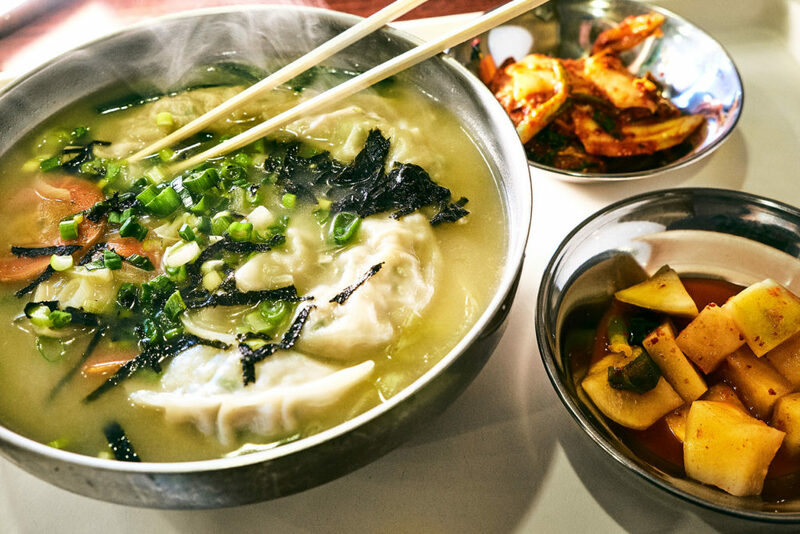 The brief billboard menu at this casual, counter-order spot announces the agenda: fresh handmade Korean noodles, which come thick like udon in a clear broth, and dumplings, steamed or baked, with fun variations that include the less common kimchee. Eaten together or separately, they can be your initiation into a popular Korean mix-and-match meal. Browser window: Nicole Kwon, a clothing designer who runs her namesake shop in the West Village, in the aisles at Carrollton’s Super H Mart, showing us how it’s done. Super H Mart anchors New Koreatown with its vast Mecca of staples. Go for live fish and shellfish, a produce section with a staggering array of Asian vegetables (from varieties of bok choy to loofah, enoki mushrooms to horned melons), and a food court with seafood pancake to steamed buns, barbecued short ribs to bubbling kimchi stews and bibimbap. 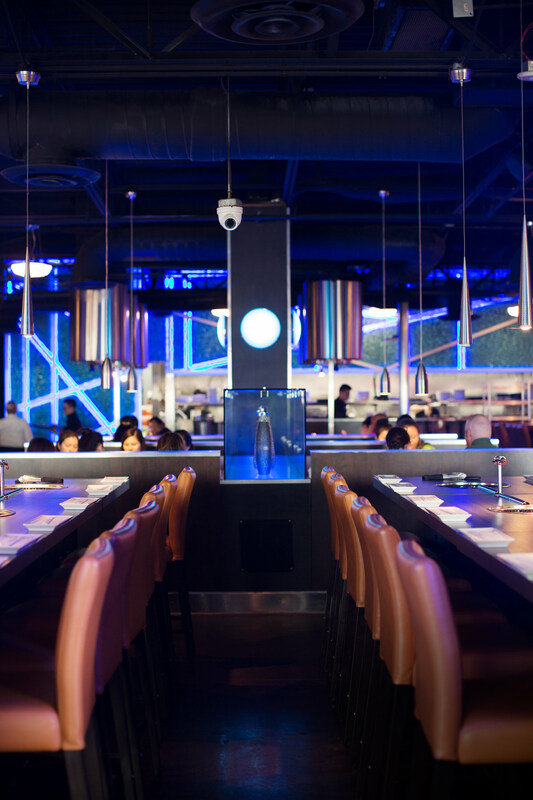 When you want contemporary twists on Korean barbecue— calamari dusted with green tea salt, Cajun pork belly, Hawaiian steak that comes with grilled pineapple—brave the lines and go to Gen Korean BBQ, where the lights are electric neon blue and the vibe is poppy. The West Coast chain’s menu is all-you-can-eat and the evening can end with macaron ice cream sandwiches.